The area of New England I spent parts of my childhood in was landlocked (well there’s a lake on one side), yet even I am nostalgic for cold and creamy lobster on a split bun. Like pesto, corn on the cob, peaches, strawberries, watermelon, and tomatoes, lobster rolls are best when eaten in season, when it’s muggy if possible, and on the hood of your car, at a picnic table, or on a picnic blanket. Tonight I ate my first of the season, and hopefully not my last. It wasn’t eaten on a car or a blanket, but my tongue didn’t seem to mind. It was New York City, the West Village to be precise, far from the fish shacks of Cape Cod, Maine, or Long Island. 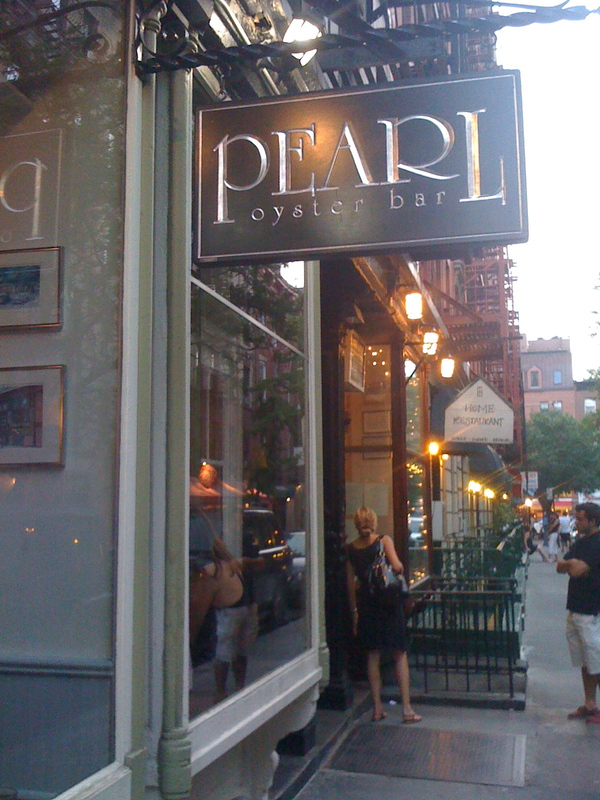 Pearl Oyster Bar opened on Cornelia Street in 1997. Its proprietor, Rebecca Charles, named the place for her Grandma Pearle, with whom she’d summer in Maine throughout her childhood. Chef Charles maintains that before Pearl, there was no lobster roll on the island of Manhattan. I’m willing to believe that. It’s 2011, however, and lobster rolls abound. You can buy them off food trucks on Varick Street, at a fish monger’s in Chelsea Market, or near a wharf in Red Hook. There’s Luke’s Lobster and Ed’s Lobster and Urban Lobster. Then of course there’s Smorgasburg in Williamsburg and the Brooklyn Flea and I’m sure Tom Colicchio is serving them up on the HighLine somewhere. The city has become lobsterfied. I’m waiting for David Chang to concoct a version of the dish – perhaps it would be made with Japanese mayo and served with pickles on Chinese steamed buns. Hmm, I shouldn’t give away that idea for free. And why doesn’t Danny Meyer serve these suckers at Shake Shack? My guess is because the lines are already too long. Yuji and I met for an after-work dinner and found ourselves in front of IFC on 6th Ave. in the Village. It was so bloody hot I proposed just hopping into the theater to see Werner Herzog’s Cave of Forgotten Dreams. But we were both so hungry it would’ve required a large tub of popcorn to take the edge off. I mentioned I was craving calamari and Yuji said he also wanted seafood. We remembered Pearl around the corner and poked our heads in to check the damage. Pearl has a reputation for being not only the best place for lobster rolls in the city (and an excellent place for all sorts of other seafood), but also one of the busiest, even at 7 pm. It has an early evening crush due to the post-work clientele of men in collared shirts with loosened ties and women in heels wishing for flip flops, as well as dads at the bar teaching their kids how to clean steamers, and lone diners relishing in the luxury of well, dining alone at Pearl. Our bucket of steamers arrived three minutes after we placed the order. There’s a ritual to steamers: pry open the shell, pull what can only be called foreskin from the foot of the clam, bathe in the little bowl of water provided to you, dip in butter, deposit into mouth. I forgot all about the lemon. Who needs lemon when you have buttery clams? Yuji and I devoured 12 in less than that many minutes. Next came our Caesar salad, cold and crisp and drenched in anchovy dressing and garlic. The tiny croutons were just the crunch the salad needed. I know, who needs salad when you’ve got lobster coming? I happen to love a good Caesar and think the flavors complement a seafood course well. Besides, Caesar is not a feeble salad, it packs a punch, and I think it says a lot about a restaurant. Then it came. The top-split buttery brioche hot dog roll with chunks of lobster meat dressed in creamy mayo, salt and pepper, and I’ll be damned if there was celery, lettuce, or a sprig of anything green in sight. Traditional. Why mess with a good thing? Therein lies the success of Pearl. I’m glad there’s room for both in this world—a Changian lobster bun as well as the classic. The fries are spaghetti-thin and come with vinegar and ketchup. And the gazpacho, adorned with (more) lobster meat and two cold, poached shrimp, was refreshing and crunchy and right on the money. I could’ve danced all night. So yes, it was good. It was everything I’d hoped for since I walked in Pearl’s door at 7:03 and couldn’t believe the luck of the man at the bar with a lobster roll and fries in front of him. All to himself. Does it get better than that? I had to brace myself for the possibility we’d never get a table. I didn’t think I could be so lucky on this hottest day of the year, when the temperature hit 98 if not 100 and instead of dipping my toes off a dock somewhere I was dragging them on the pavement. I think I even stepped in melted chewing gum today. Well New York: you did good. Thank you Pearl Oyster Bar. You make being in this city more bearable on nights like this. Pleasurable, even.